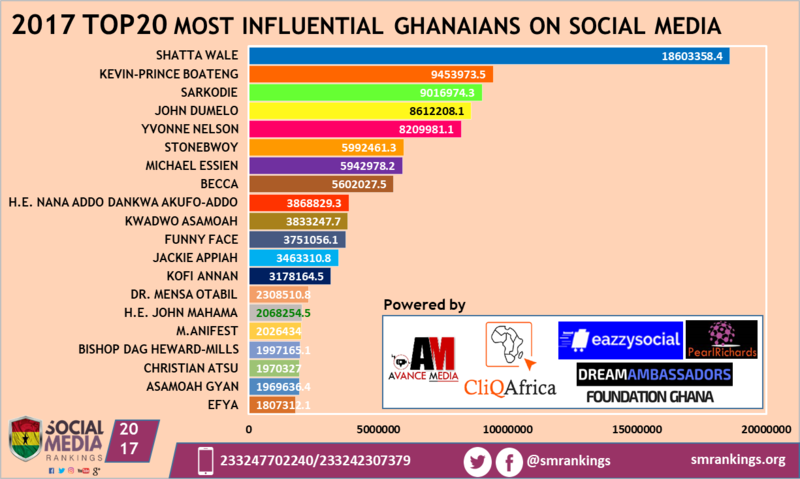 Dancehall artiste and Shatta Movement founder, Charles Nii Armah Mensah also known as Shatta Wale has been ranked as the 2017 Most Influential Ghanaian on Social Media according the 2017 Ghana Social Media Rankings spearheaded by Avance Media, CliQAfrica, eazzysocial and Dream Ambassadors Foundation GH. 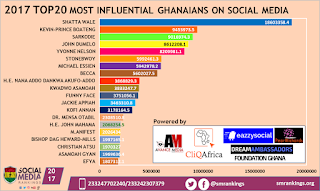 Shatta Wale who rose from the 15th position in 2016 ranking, beat off competition from all top Ghanaians on social media to attain the eminent position that makes him the Ghanaian brand with the most engagement on social media in Ghana. Following him keenly are Footballer, Kevin-Prince Boateng, rapper Sarkodie and Actor John Dumelo. These personalities and more were monitored across Facebook, Twitter and Instagram throughout 2017 and aside their total followership; Growth Difference, Engagements, Post Reach and Mentions in 2017 were also considered in the research for this ranking. Potential entrants onto the ranking include; Ameyaw Debrah, Edem, and R2bees.